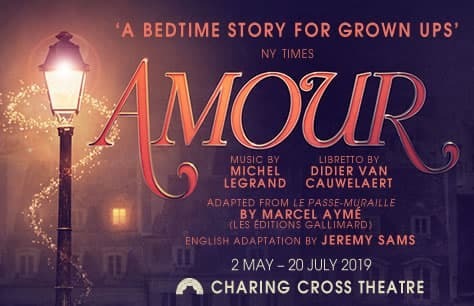 Michel Legrand's hit Broadway musical Amour receives its long-awaited UK premiere at London's Charing Cross Theatre this summer. Tickets to the UK premiere of Amour now on sale! The London premiere of Broadway's Amour at the Charing Cross Theatre feels like a long time coming with Londoners having to wait a cold hard 17 years. Be among the first to get your hands on Amour London musical tickets by booking your seats early! Tony Award-nominated musical Amour was written by legendary French musician and composer Michel Legrand and it is based on the hit short story, Le Passe-Muraille, by best-selling French novelist Marcel Aymé. Featuring an original French libretto by Didier Van Cauwelaert that was translated into English by renowned theatre director Jeremy Sams, Armour is undoubtedly a world-class production that would be criminal to miss! Unfortunately, the show's writer, Michel Legrand, will be missing the long-awaited London premiere. The late musician passed away last month at the age of 86. The Broadway production of Amour marked his Broadway debut and the upcoming Charing Cross Theatre production will mark an unofficial homage to the legend, who had long since dreamed of being able to see his masterwork Amour play out live on the London theatre stage. What is Michel Legrand’s Amour musical about? Amour is a fantasy that takes place in Paris in 1950. It follows a timid and modest civil servant named Dusoleil, who lives by himself and works long and hard in a gloomy office. In order to make time go by quicker at his mundate job, he writes his mother letters and dreams of a fantasy world in which a gorgeous woman named Isabelle is kept locked up by her egocentric husband. Soon, Dusoleil unsuspectingly gains the superpower of walking through walls and begins to live a double life as a 'French Robin Hood.' In order to bring justice to the war-impoverished Parisians, he begins stealing from the rich and giving to the poor. Throughout it all, he gets a boost of self-confidence to win over the amour of Isabelle and live the life he's always wanted. Amour received its world premiere in Paris in 1997 before transferring to Broadway’s Music Box Theatre in 2002. The brief Broadway run was directed by James Lapine and closed after just 48 performances. Despite being whisked away from the stage so quickly, the musical enjoyed phenomenal success with its numerous major award nominations. IT received an astonishing five Tony Award nominations in 2003, including for Best Musical, and was additionally nominated for a whopping nine Drama Desk Awards, including Outstanding Musical, Acotr, Featured Actor and Director. The Charing Cross Theatre production of Amour will be directed by Hannah Chissick (Aladdin at Theatr Clwyd, Mother Courage, Flashdance, Rent at the Pleasance Theatre) and features choreography by Matt Cole (Fiddler on the Roof, Cinderella), production design by Adrian Gee (Urinetown), lighting design by Rob Halliday, (Equus, Les Miserables, Mary Poppins) sound design by Andrew Johnson, (Peter Pan Goes Wrong, The Play That Goes Wrong, A Comedy About A Bank Robbery) musical direction by Jordan Li-Smith (Joseph & The Amazing Technicolour Dreamcoat, Amour at the Royal Academy of Music, Sir Jack Lyons Theatre) and production and casting by Danielle Tarento (Fame The Musical, Jesus Christ Superstar, The Canterbury Tales). Casting for the upcoming Charing Cross Theatre production of Amour will be announced in due course. Tickets to Amour at the Charing Cross Theatre are among the hottest London theatre tickets of the summer. Don't miss out on the long-awaited premiere of Amour and book your London Amour tickets now while stocks last! Latecomers may not be admitted, and there is no readmittance once the performance has started. Valid Monday - Thursday performances.